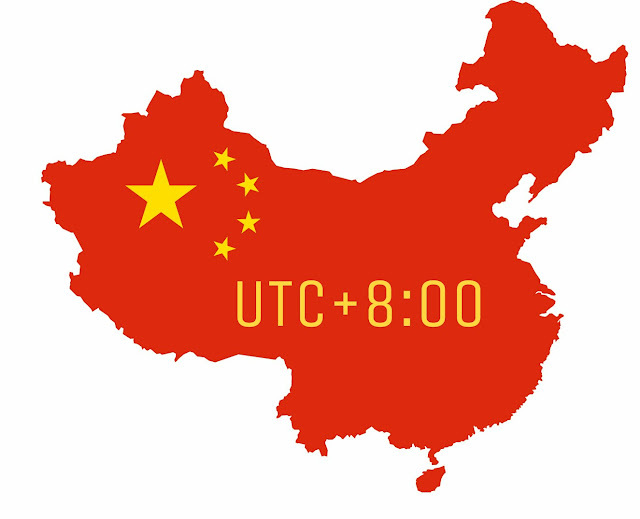 China, a country in East Asia, which spans five geographical time zones, follows only one national time zone - Beijing Standard Time (BST) (UTC+08:00), also known as China Standard Time (CST). It is the largest single time zone area in the world. In comparison, United States that is of roughly similar size to China, has four time zones. There was no national wide time standard in China until early 20th century. In 1912, the year after the collapse of the Qing Dynasty, five different time zones - Kunlun (UTC+05:30), Sinkiang-Tibet (UTC+06:00), Kansu-Szechwan (UTC+07:00), Chungyuan (UTC+08:00), and Changpai (UTC+08:30) - were established in the country by newly empowered Republic of China. After completion of the Chinese Communist revolution in 1949, the Communist Party took control of the country. Chairman Mao Zedong and new leaders of China abolished the five time zone system and established single time zone for purposes of national unity. For most part of the country, single time zone is viewed as a minor inconvenience. Xinjiang Uyghur Autonomous Region which is in northwest of the country, prefer to their own unofficial local time zone (UTC +6:00) which is two hours behind official Chinese time. For Uyghur population, political reason for using their own time is they consider their time as a psychological tool for independence. In Xinjiang's extreme west of china, near China’s border with Pakistan, Beijing Standard Time is so irrelevant that it isn't used on government offices, stores, even in bus timetables.